Acupuncture treatment has a relaxing and recalibrating effect on your nervous system, which can become strained with lack of sleep and long term build up of stress. As the stress response begins to subside, the body and mind can return to a state of homeostasis and it is easier to be in harmony with the circadian rhythm. increased energy and vitality during the day, deeper more restorative sleep, improved digestion, better mood, increased libido, better response time to workouts and injury recovery, more radiant appearance. When you are more relaxed, you feel better, and are able to respond better to the challenges of life! This series of Acupuncture, Sound healing, Taoist relaxation techniques and herbal prescription will unwind the stress and trauma coiled in your nervous system and allow you to rediscover a healthy balance of rest and vitality in your daily life. *This information has not been approved by the FDA. Copyright © 2019 Rose Goodman Acupuncture & Vitality All Rights Reserved. This web site offers health, wellness, fitness and nutritional information and is provided for informational purposes only. This information is not intended as a substitute for the advice provided by your physician or other healthcare professional. You should not rely on this information as a substitute for, nor does it replace, professional medical advice, diagnosis, or treatment, Always speak with your physician or other healthcare professional before taking any medication or nutritional, herbal or homeopathic supplement, or using any treatment for a health problem. If you have or suspect that you have a medical problem, contact your healthcare provider promptly. Do not disregard professional medical advice or delay in seeking professional advice because of something you have read on this web site. The use of any information provided on this web site is solely at your own risk. 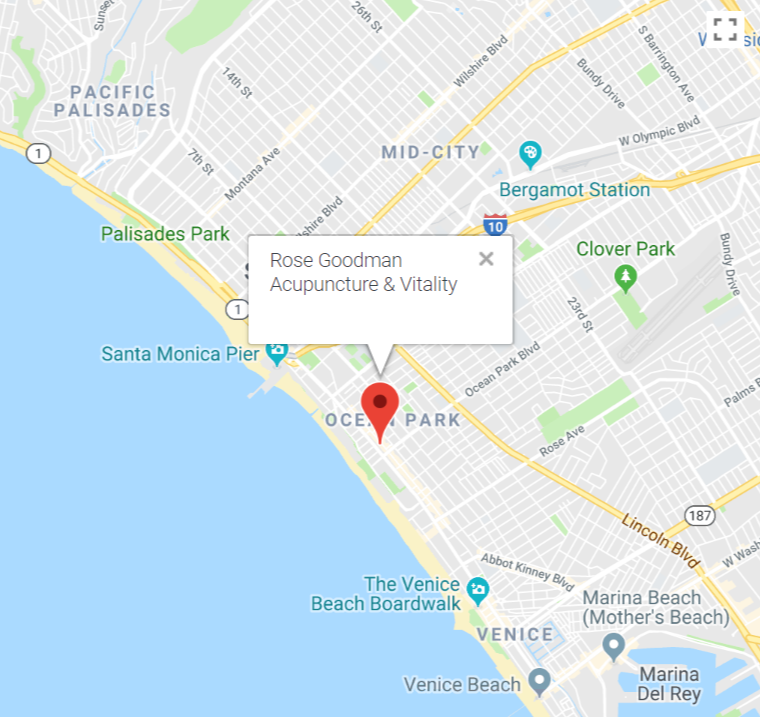 Nothing stated or posted on this web site or available through any services offered by Rose Goodman, L.Ac and Acupuncture & Vitality Inc., are intended to be, and must not be taken to be, the practice of medicine. Information provided on this web site DOES NOT create a doctor-patient relationship between you and any doctor affiliated with our web site. Information and statements regarding dietary supplements have not been evaluated by the Food and Drug Administration and are not intended to diagnose, treat, cure, or prevent any disease.